LAKE TAHOE, California, August 16, 2011 (ENS) – Today, for the first time since 1997, the governors of both California and Nevada attended the annual Lake Tahoe Summit, and they pledged their cooperation in returning clarity to the clouded waters of the famous lake. By personally attending the summit and bringing top officials from both states to the same table, the two governors are making Lake Tahoe a top priority and seeking greater cooperation on issues affecting the lake shared by their two states. At California’s Homewood Mountain Resort, California Governor Jerry Brown, a Democrat, and Nevada Governor Brian Sandoval, a Republican, signed an agreement to return clarity to the lake to a depth of 100 feet within 65 years. 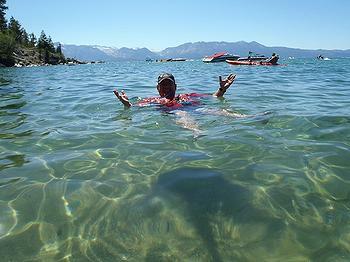 The water clarity of Lake Tahoe declined from a visibility level of 105 feet in 1967 to an all time low of 64 feet in 1997. Ten years of scientific study has determined that fine particulate matter is the prime reason for the impaired clarity of the lake. The Clean Water Act allows states and U.S. EPA to develop a Total Maximum Daily Load, TMDL, that sets a maximum pollution level for impaired waters to help them recover. The two governors signed the Lake Tahoe TMDL today. The two governors also renewed their commitment to updating the Regional Plan for Lake Tahoe and cooperating with the Tahoe Regional Planning Agency, which covers the entire Lake Tahoe watershed across state and local political boundaries. The 20-year Regional Plan has not been updated since 1987 and is now four years overdue. The Lake Tahoe TMDL is the result of a decade of work by federal, state and local agencies and public stakeholders to understand what pollutants affect the lake’s clarity and to develop a cost-effective, workable solution. Research shows that restoring lake clarity is possible if pollutant loads can be reduced for the four primary sources: urban stormwater runoff, forest runoff, stream channel erosion and deposits of pollutants from the air. The TMDL outlines measures to reduce each of these sources, with a focus on the urban stormwater runoff source, as it is both the greatest source and the best opportunity to control the pollutants. “I commend Nevada Division of Environmental Protection and the Lahontan Water Quality Control Board for developing a scientific plan to restore the clarity of Lake Tahoe. The years of hard work and collaboration have paid off,” said U.S. Senator Dean Heller of Nevada, a Republican. Achieving the load reductions outlined in the TMDL will be challenging. California’s Lahontan Regional Water Quality Control Board and the Nevada Division of Environmental Protection are working with local jurisdictions: the counties, departments of transportation, the City of South Lake Tahoe, and private stakeholders. “Since much of the pollutants of concern are the result of a 50 to 60-year-old built environment, one opportunity for meaningful load reduction is to rebuild many of these older structures incorporating state-of-the art green technologies,” said Feldman. The federal government will provide $43 million for a variety of conservation and recreation improvement projects throughout Nevada and Lake Tahoe, Secretary of the Interior Ken Salazar said today. The total includes more than $34 million for Lake Tahoe restoration projects. The funding is a result of the Southern Nevada Public Land Management Act, which uses proceeds from sales of federal land in Clark County, Nevada, to fund environmental restoration, conservation and public recreational projects throughout the state.